What would Health and Safety have to say about this today? 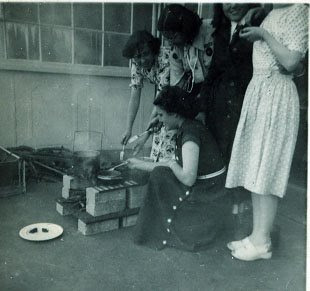 Girl Guides teaching patients how to light a fire and barbecue on Ward 2 balcony. 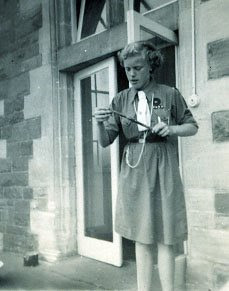 Guide leader prepares a sausage for the balcony barbecue. Every time I tie a reef knot I remember where I learnt it: as a guide at Craig-y-nos. Therefore I have fond memories of the guides for they represented a direct contact with the outside world, apart from monthly visits from parents, so I was delighted to receive the following email from Helena Thomas.
" Next year Guiding will be celebrating its Centenary. We hope to publish a pictorial book about Guding in Wales and I am hoping you will give permission to publish some of the photographs you sent me. The Guides at Craig-y-Nos are an important part of our history. I have found out the names of the leaders who helped and the dates they were there, but that is all the information I have at present. You have certainly found out a lot about Craig-y-Nos when it was a hospital. Our county AGM is on 24th April and our guest speaker is going to talk about Craig-y-nos."